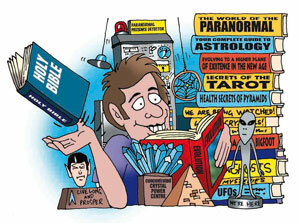 Bruce Hood, a psychology professor at Bristol University, claimed that humans evolved to be susceptible to supernatural beliefs.4 He juxtaposed ‘creationism and paranormal phenomena’, claiming that they are both held by ‘faith alone’. He equated religious belief with superstition. God endowed us with brains and provided evidence for us to see and believe. Dead people cannot save themselves. But God made us alive in Christ Jesus. Furthermore, Christian faith is not ‘faith alone’ in Hood’s misleading sense of being without evidence. Hood claimed that ‘creationism’ has been ‘countered by the evidence’. He probably also argues that creation should be excluded from science classes because it is not testable—many Skeptics seem to embrace these contradictory notions! 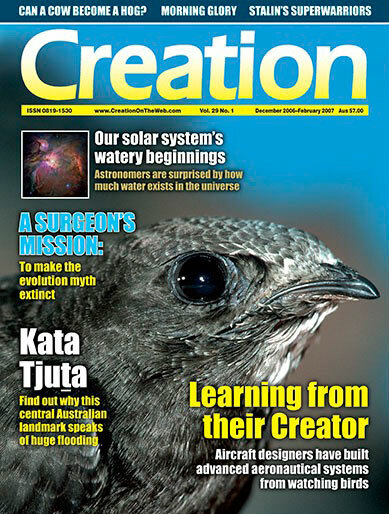 Creation magazine provides abundant evidence that supports biblical creation. Christian faith involves evidence; it is not blind faith (Luke 1:1–4; John 19:35, 20:31; Acts 1:3). God endowed us with brains and provided evidence for us to see and believe. The universe itself testifies to creation which requires a Creator (Romans 1:18–20). The big bang notion that the universe made itself from nothing without any cause defies the most basic principle of science and logic: something that has a beginning has a sufficient cause. Many have tried to refute the evidence for the resurrection and ended up following Christ. We pray that this issue encourages you in your reasonable faith and that you can share articles with those who are perishing, to challenge their unbelief. The root of all evil? Episode 2: The virus of faith, Channel 4 (UK), aired 16 January 2006; channel4.com/culture, September 2006. Bainbridge, W.S., and Stark, R., Superstitions: Old and New, The Skeptical Inquirer 4(4):18–31, Summer 1980. Wieland, C., Antidote to superstition, Creation 20(2):4, 1998. Henderson, M., Superstition the product of evolution, The Australian, 6 September 2006, theaustralian.com.au.